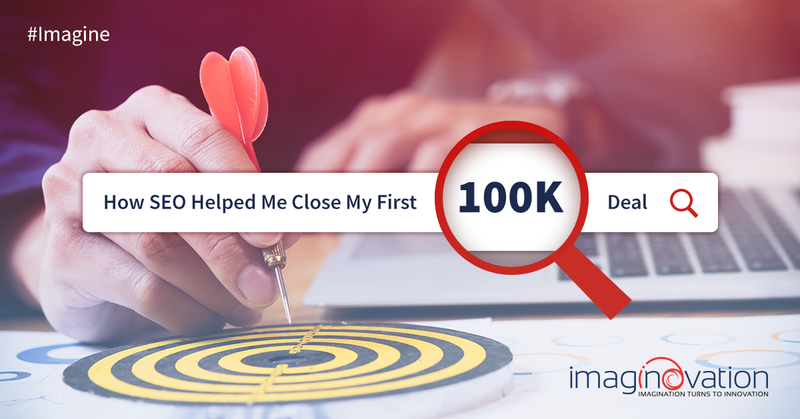 The journey to closing that first 100K deal was centered on my ability to take my knowledge of the digital marketing world and apply it to my own sales technique. However, no amount of digital know-how or sales knowledge can replace tried and true business practices that have been working forever. Though I’ve discovered that this new world of online business can certainly inform how I do business, the bones of success are integrity and grit. Having a skill set that’s in high demand was a critical factor in my success. My knowledge of SEO, and more importantly, my ability to effectively execute an SEO plan, were what set me apart from the beginning. What’s inspiring to potential customers? More than knowledge or experience, it’s passion and professionalism that bring people to your door in business. A major reason that new businesses fail is because they aren’t transparent enough with their processes, nor do they respond quickly and adequately to the situations at hand. Communication is key to getting a sale, as it establishes trust and openness from the very beginning. The virtual world works for much of our communication, but nothing compares to face to face meetings with potential customers. Body language, tone of voice and that human touch are important factors in making a sale. If you skimp on the proposal, customers have every reason to believe you’re going to skimp on the work. If you want to land a big client, give them something big and impressive to look at in your proposal. Though we live in and age of instant gratification, there’s just no way to rush the process. Big deals come to those who are patient. Take your time! Let the process build and grow. In many ways, Search Engine Optimization (SEO) is a microcosm of the larger world of marketing. If you understand SEO, then you understand sales. SEO supplies qualified inbound leads that already want to connect. That’s exactly what you’re looking for in getting that big contract – qualified leads that are primed and ready to hear you. Your messages can fall on cold ears if you’re not careful, and that’s a total waste of your time. If you have the right tools, you can know which keywords they were looking for when they arrived at your website in SEO. The same goes for working with sales. When you know what your potential customers are looking for, you can build a relationship with them that can be profitable for everyone. When we talk about SEO, one of the major issues that we talk about is user experience (UI/UX). That’s not just something that happens to website visitors though. In sales, the user experience matters. You need to get this part right in order to facilitate that closing. Give potential customers a straightforward and easy to navigate process for engaging with you – make it easy! The other major lesson that SEO can show is just how much of a numbers game this really is. You’re not going to land a giant deal by calling up three potential clients – you need to reach out to as many as possible. The more you put yourself out there, the more client deals you’re going to strike gold with. These four steps are your guide to landing a big deal using SEO. These (sort of) easy steps are all you need to make that big sale happen! What is pull marketing? Think media promotions, word of mouth, and SEO! SEO offers us a blueprint for the inbound sales approach. Get the customer to come to YOU instead of the other way around. Pull marketing provides leverage to sell at a higher price point. It also provides credibility by providing value and competitive differentiation. SEO allows you to get valuable information on your potential client BEFORE you attempt to make the sale. That same kind of thirst for knowledge can be applied to your sales process. Do your research and planning! When you’re thinking about getting that big sale, think about the following SEO questions and how they factor in to your offline sales approach. What were they searching for? What did they do to get here? Did they do anything to indicate their interest? How many times did they offer contact? Having a lot of leads is a good problem to have! Your SEO and your lead generation techniques are working as intended. Here are some questions to ask about your potential new clients and how you react to and reach out to them. Will this lead benefit from our service or product? Can this lead afford our service or product? With other services/products can this lead benefit from? The sale isn’t over when you sign them up. You need to check in throughout the process. At the end of the day, it’s not just about the sale – it’s about the long term relationship. To that end, you should put into place a support and feedback process to keep that client happy and interested. There is always room for upselling at the right time, so be open to getting more out of your sales on any given day if you offer the right add on! You can also always ask for a review/referral. One sale leads to another and another on the ground, just as it does with SEO. The more you know and implement the techniques that are so successful for SEO into your sales process, the easier it will be for you to get the deal you want and create the success you need. SEO led me to my first big sale, and it can lead you to those same kinds of achievements. You can’t have great SEO without a well-designed website! Is yours up to date?